Want to make finding wedding favours easy, then this your answer. These delicious and delightful wrapped confectionery products can be used as wedding favours. No need to add anything else so helps simply the wedding favour planning process. 1 kg boxes of mixed pastel coloured sugar coated chocolate eggsThese delicious sugar coated eggs are.. Packs of approx 100 Drink Champagne Neapolitans Text Reads: "It's time to Drink Champagne and D..
Case of 180 Foil wrapped Just Married coins.These make an ideal choice for wedding favours or candy .. Packs of approx 100 gold heart chocolate NeapolitansContemporary style confectionery individually wr.. 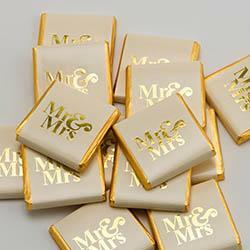 Packs of approx 100 Mr & Mrs Neapolitans Contemporary style confectionery individually wrap.. Packs of approx 100 Mr & Mrs Neapolitans - SilverContemporary style confectionery individu.. Packs of approx 100 Rose Gold Heart Chocolate NeapolitansContemporary style confectionery individual.. Packs of approx 100 Thank You Neapolitans Contemporary style confectionery individually wrapped.. Packs of approx 100 Time to Celebrate Neapolitans - Silver/GoldContemporary style confectioner..